"1-Call Cleaning Services is reliable, courteous and offer quality work. I have been dealing with them since 2005 …I do feel confident in referring them to my clients and other businesses…I have seen and dealt with other contractors, but not like 1-Call Cleaning. 1-Call Cleaning Services is a five star contractor." – William Issa, Woodwyant Inc.
Grout lines are easily cleaned and restored back to their original colour with 1-Call's commercial grade vaporizer. Mildew and other grime melts away quickly without the use of chemicals with the use of the vaporizer by scrubbing grout lines with 200 degrees F water vapour. Shower stalls, entranceways and pool decks are common areas that the vaporizer is used most often. 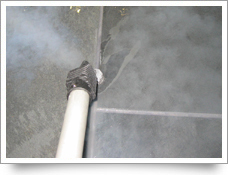 Door transition plates are also cleaned very efficiently with the use of the vaporizer. Please contact us for a free estimate at 1-877-CLNS-ALL or info@1callcleaning.com.